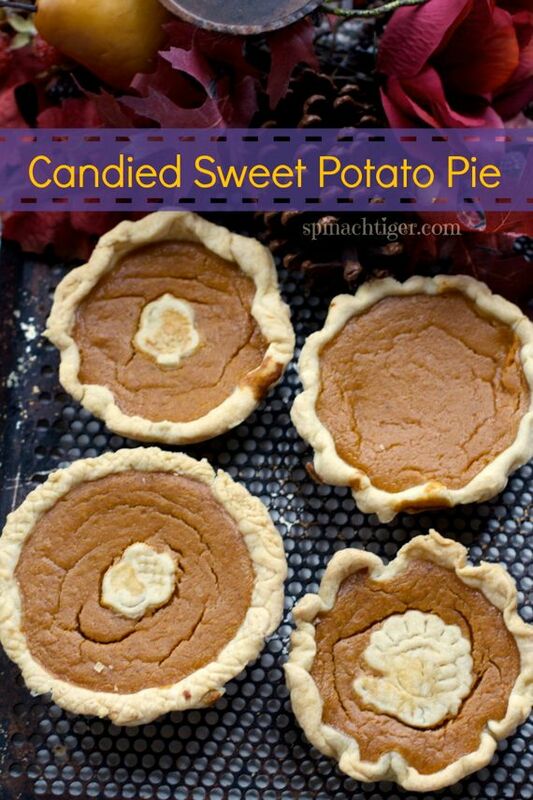 Two ways to make sweet potato pie. Method 1 uses candied sweet potatoes. Method 2 is more typical. Puree candied sweet potatoes in food processor or Vitamix. Add evaporated milk, eggs. Blend. Roll out pie dough and place in pie pan. Fork the bottom. Pour puree into the shell. Bake at 350 for 45-50 minutes, less if making small tarts and pies. If you don't have left over candied sweet potatoes, you can make these ahead and cool first. Peel, and slice potatoes cross wise. Put butter, brown sugar, and spices in pan. Cook until melted down. Put in sweet potatoes, squeeze orange and throw in pot. Cook for 45-60 minutes until sweet potatoes are softened.